A DETERMINED expat is devastated after being told she cannot have the drug she has been campaigning for. Doctors told Coin resident Becky Baker, who has cystic fibrosis, she is now too ill to have the Orkambi drug, despite being well enough when she first requested it a year ago. It is the latest blow for Becky, 32, who spoke to the Olive Press last issue (see left) after Malaga’s Carlos Haya hospital, where she is a patient, said she was no longer eligible for for a lung transplant due to having too low a lung function. She had been campaigning to have American drug Orkambi legalised in Spain, which thins mucus, to help those with the progressive lung condition. 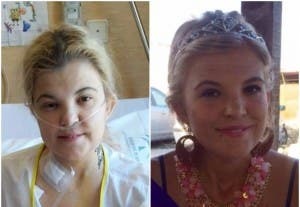 “For the hospital to only say now I could have had the drug were I better when I began to campaign to get it so long ago is so gutting,” said Becky, originally from Somerset. Her family has ramped up its plea to find an alternative treatment. “If anyone out there has any other suggestions for us or would like to fundraise to enable more research into CF that would be great,” said Becky’s mum, Sarah.